In November the stock markets, via the S&P 500, were a bit hesitant to start the month but ended it with a bang after Trump's surprising victory in the election. All told the S&P 500 climbed over 3.4% during November. Since a large portion of my net worth is tied to the performance of the markets my net worth typically moves in line with said markets. Of course pulling in over $250 in dividends helped out as well. 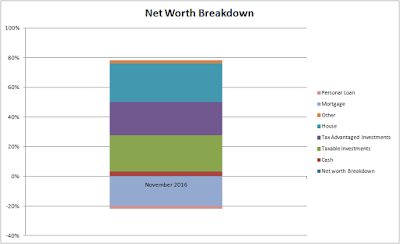 For the month our net worth increased $4,228.08. We finally broke the 4 month streak of net worth drawdowns and ended November with a solid $4k improvement. Much of the increase was due to the rally in the markets after Trump's victory in the election. For the month our net worth increased 0.91% although year to date it's climbed 13.23%. As of the end of November we have 24.1% equity in our house based on our purchase price from 2013. However, according to Zillow our house has increased in value $23.5k from our purchase price which is a nice bonus, although I keep the purchase price as the value in the net worth equations. Based on Zillow's estimate the equity in our house is 31.5% thanks to the appreciation. Truly passive income, dividends and interest, totaled to $279.99 during November which is over a $50 decrease from August's total of $333.63. All of the decline is due to dividend payment timing and the closing of positions within the period. *Dividends are from my taxable accounts only. Adding in the gross income earned from blogging/writing added another $242.03 to the monthly non-day job income total. I don't think anyone out there would complain about an extra $500 coming their way each month that isn't tied to their day job. Although admittedly I hope to find a way to boost up the blogging/writing income in 2017. We've still got a long ways to go to reach our goal of financial independence, but we're heading in the right direction. Year to date we've generated just under $8.4k outside of traditional employment sources via dividends, interest and blogging/writing. 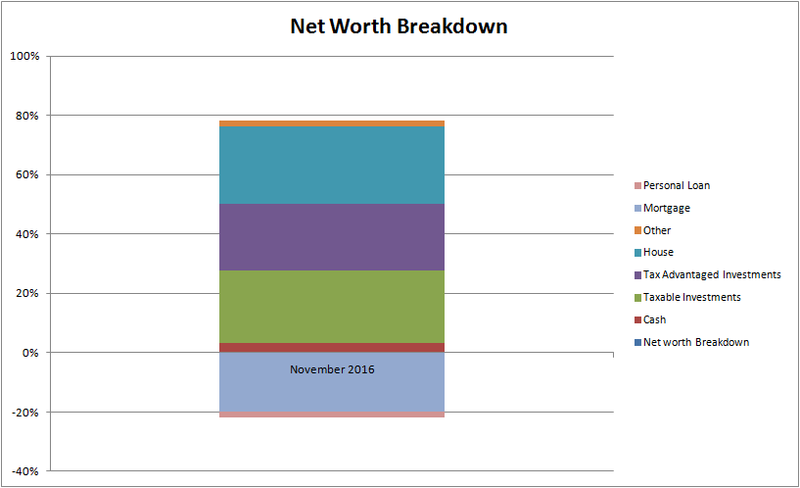 How did your net worth fare in November? With one month left in 2016 are you on track for your net worth goals? Nice work and great addition. I agree on the no paydown on the mortgage, I am in the same boat, and if rates are increasing - your rate is more favorable to keep for longer; as you can't refi or even take out a new loan at the rate you currently have. Nice job and I bet December will be great as well for you. Congrats on a return to positive growth! It looks like December will continue those gains too. I look forward to seeing you beat the $500k threshold in 2017. November was a good month for me too - around 8.5% gains in my wet worth. I don't include the house price in that calculation though. I think my Zillow estimate was down a bit for the month. Best wishes to you and your family. Have a great new year! Nice results. Making 8.4 K outside a traditional job is quite impressive. Keep the system running for a few more years and you will be fine. Excellent progress, PiP! 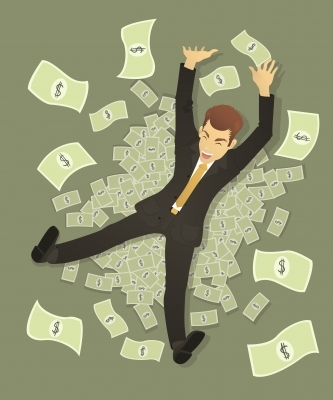 December is probably going to be another great month for your net worth!